In the field, samples were simultaneously collected over several seasons and years (2011-2014) for contaminant analysis and infaunal invertebrates using a grab sampler, which is deployed on a long cable from a boat and allowed to settle on the seafloor. The sampler closes rapidly and forcefully, picking up sediment samples with relatively little disturbance of the contents. Only the top 5 cm of sediment from one half of the grab was used for contaminant analysis; the other half was used for infaunal invertebrate identification and community analysis. This allowed for a direct comparison of the sediment and invertebrate data. measured in sediments from the reference sites were compared to established environmental quality thresholds developed by the Canadian Council of Ministers of the Environment (CCME). Of all the chemicals measured, only arsenic and nickel exceeded the sediment quality thresholds across reference sites for some samples and dates. However, the levels of these metals did not exceed the higher CCME “probable effects threshold” (the level above which adverse effects are expected to occur frequently). In addition, these results likely reflect the fact that arsenic concentrations are naturally high in some geological formations around Atlantic Canada. Overall, there were minimal differences in the levels of these pollutants over time across reference sites, which supports the use of these sites in future monitoring activities as comparisons to others which have more likely or known impacts. Total abundance of invertebrates and abundance of individual species were measured, as well as species diversity and the composition of the overall invertebrate community at the reference sites. There were differences between inner and outer harbour sites in the relative make-up of infaunal invertebrate communities, with polychaete worms (annelids) most abundant at all sites, but higher numbers of clams at outer harbour sites. 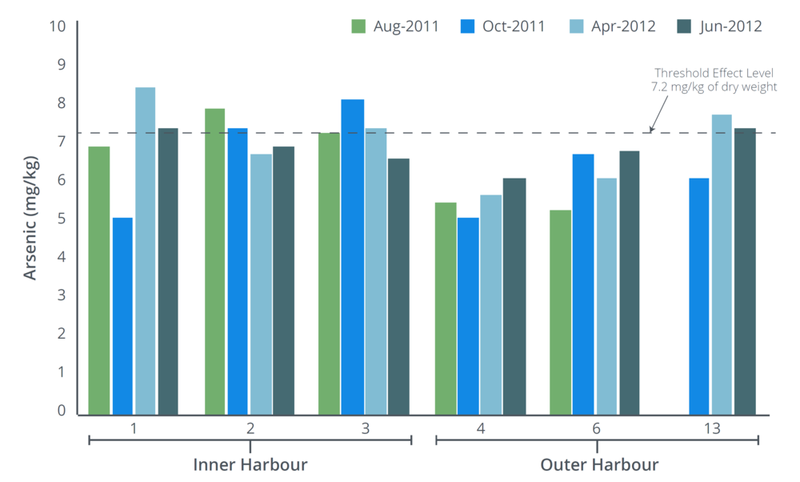 Results for all of the invertebrate measures were variable over time and space in the harbour, which is similar to findings from other estuarine environments. This type of variability may be related to physical or chemical features of the estuary, such as availability of organic matter in sediment as a potential source of food, tidal action, salinity and water depth, as well as competition between species for food and space. Sixteen potential sites of concern (“hotspots”) were sampled from 2012 to 2014. Infaunal invertebrate communities in the outer harbour near the dredge disposal site had high species richness and were similar to those at outer harbour reference sites. Invertebrate communities at a few inner harbour sites (Courtenay Bay, Bayside) differed from those at reference sites, which may be due to differences in habitat (depth, sediment grain size), organic enrichment (Courtenay Bay) or potentially to increased PAHs or metals. Two species of infaunal invertebrates – the Atlantic nut clam and catworm – were assessed to understand natural patterns in their growth or reproduction at reference sites and their usefulness for assessing impacted sites. These species were selected because they are abundant in the harbour, have not been well studied in the past, and could potentially serve as sentinel species. Sentinel species can provide useful information about the overall ecological health of an area, as they are relatively sensitive to a variety of disturbances like physical habitat damage and chemical pollution, and indicators of their growth, reproduction or other biological traits can demonstrate whether they (and therefore other species in the ecosystem) are experiencing stress. In both species, growth and abundance were measured, as well as reproduction using egg counts (catworm only). In general, clams and worms were reproducing and growing similarly (and normally based on information from other areas) across reference sites in the inner or outer harbour and good baseline data are now available to assess any long term changes. It was determined that fall is the best time of year to assess these species for reproduction, abundance and growth, and that they have good potential to be used as sentinel species in future monitoring of potential hotspots. This project generated a strong baseline on sediment contaminants and invertebrates at sites in the harbour and ongoing monitoring (fall sampling only) is recommended to continue to understand year-to-year changes. This will provide greater certainty in the results of future monitoring activities for areas of the SJH that have known or suspected environmental impacts, and facilitate decision-making around how to mitigate these impacts. ENVIRONMENT. 1999. Canadian Sediment Quality Guidelines for the Protection of Aquatic Life. PIPPY, B. 2015. Understanding variability in sediment contaminants and benthic invertebrate populations in the Saint John Harbour. Master of Science thesis, University of New Brunswick. POWER, R. 2015. Investigation of sand shrimp (Crangon septemspinosa) as a sentinel species in the Saint John Harbour, Bay of Fundy, Canada. Master of Science thesis, University of New Brunswick. VAN GEEST, J.L., KIDD, K.A., HUNT, H.L., ABGRALL, M.J., MALTAIS, M.J., AND A. MERCER. 2015. Development of baseline data for long-term monitoring of sediment conditions at reference sites in Saint John Harbour, New Brunswick: benthic infaunal invertebrates and sediment contaminants 2011-2013. Can. Manuscr. Rep. Fish. Aquat. Sci. 3076: v + 97 p.